Once you've used and finished with a SharePoint survey, you can delete all the responses, but keep the questions for reuse. 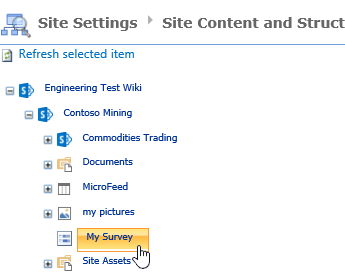 Navigate to the Office 365 or SharePoint site you want to delete the survey data from. In the address line, put sitemanager.aspx after /_layouts/ after the company or site name, and then press Enter. Some locations in SharePoint don't always have /_layouts/ in the web address. If the line doesn't have /_layouts/ in the address, replace everything after the company or site name with /_layouts/sitemanager.aspx. For example, if your site is the Contoso Mining site, your address line would look like this: http://contoso.com/sites/Contosomining/_layouts/sitemanager.aspx. SharePoint may automatically put a number that coincides with your version between /_layouts/ and sitemanager.aspx, you can ignore this. 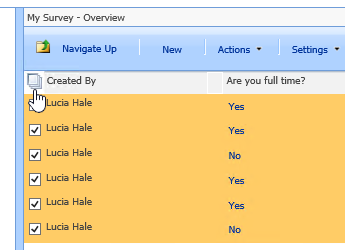 In Site Manager or Site Content and Structure, click the name of your survey in the Quick Launch bar on the left. Click the select all icon at the top of the selection column. If you want to delete some of the answers, just click the boxes you want to remove. Click Actions, and then click Delete. To return to your site, click Site Settings in the breadcrumbs, and then click Home or the page you want to go to in the Quick Launch bar.